We arrived on the Big Island of Hawaii the day before and the scenery was every bit as jaw dropping as all the tour books had described. Today would be our first full day on the Big Island and we were doing the scenic drive between the towns of Hilo and Kona. On the way, we would summit Mauna Kea, one of the islands famous peaks. Rather than taking the shorter route by cutting across the interior using Saddle Road, we decided to follow the coast. 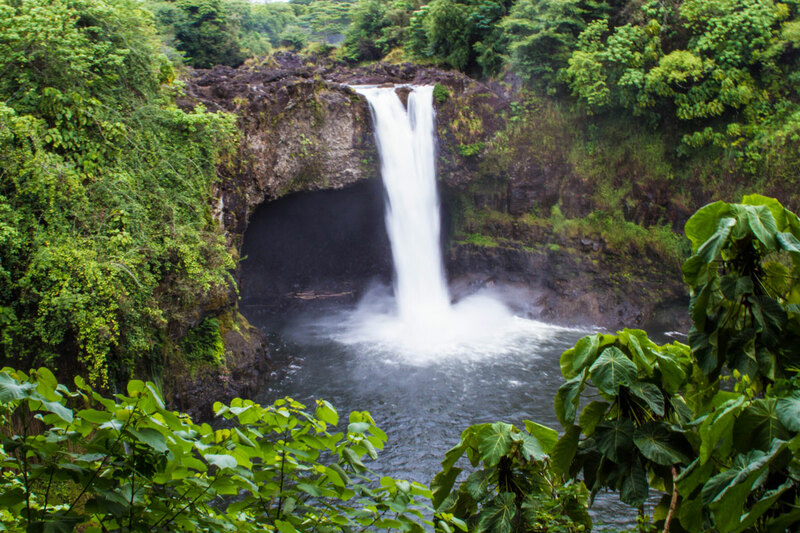 During our drive, we stopped often to gawk at waterfalls and lava tubes along Hawaii Belt Road. The shorter route would have taken slightly more than 1.5 hours without stops and the longer route double the time. Since we were planning a lot of sightseeing we left early to give ourselves enough time to be at Mauna Kea by sunset. One of the reasons the Big Island had been on our bucket list was because of the active volcanoes on the island. However, the dramatic landscape is also dotted by several dormant volcanoes. 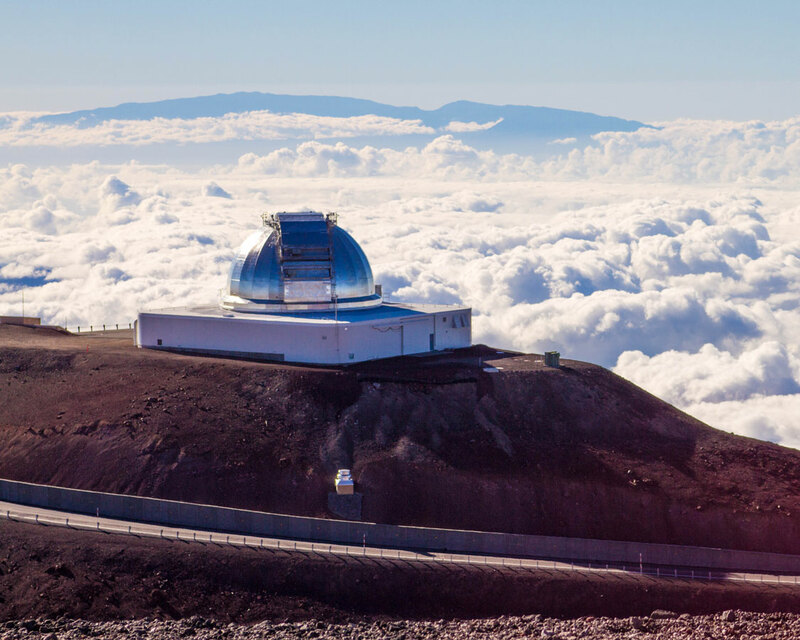 At 4207 meters (13,803 feet) the dormant volcano, Mauna Kea is the highest point in Hawaii. It is also considered the world’s tallest mountain if measured from its base on the ocean floor. One can summit Mauna Kea by car or on foot. By car, there are two options. First, it is possible to sign up for an organized tour. If you do not have a 4-wheel drive vehicle or you are not comfortable driving an unpaved, rocky and steep road in total darkness, then joining a tour is your best bet. The tours will pick you up at a pre-arranged meeting point and all you have to do is sit back and enjoy. The second option is to drive your own 4×4 vehicle. But, many rental agencies will have a caveat in their contract that their vehicle is not allowed to summit Mauna Kea and that any damage to the car due to going to summit Mauna Kea will be at the renter’s expense. We chose the later option and crossed our fingers and toes! Pro-Tip: Arrive at the Visitor Information Station a few hours before sunset to allow for time to acclimatize. But also to beat the crowds! Parking is sparse and you want to make sure you have a spot after driving all that way. 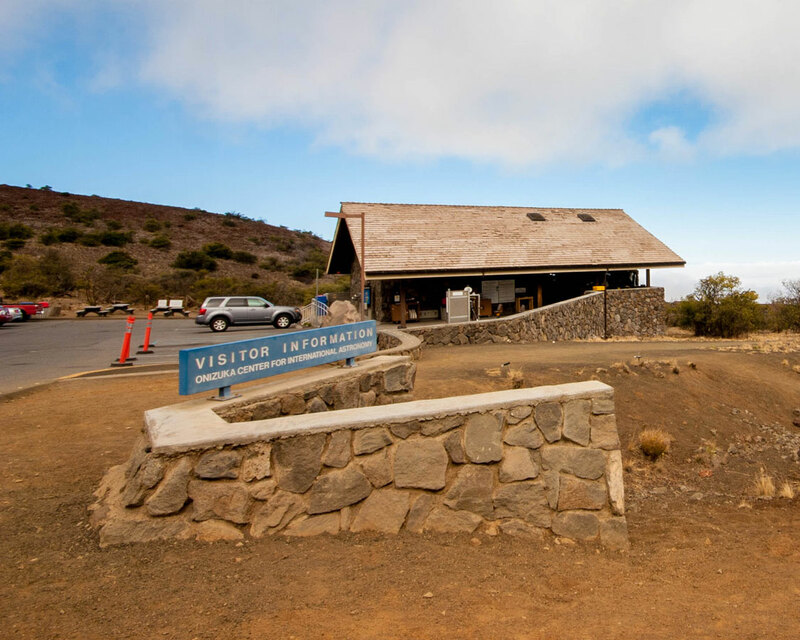 No matter which form of transportation you decide on, it is highly recommended that you include a stop at The Onizuka Center for International Astronomy Visitor Information Station for at least an hour to acclimatize to the altitude. It is also a good resource for determining the weather conditions to the summit. Plus, at 2835 meters (9300 feet) it is one of the best observation sites in the world. We found the hour passed by quickly! We had a great time pretending to be astronomers by trying out the various telescopes on hand. At the time of our visit, there was also a third option: free tours organized by the Visitor Information Station on the weekends. However, as of 2016, this program has been canceled indefinitely. But, it is worthwhile to check their website in case the tour has been revived. With sunset about to arrive in a few hours, we decided to hop into our Jeep and make the slow and winding 8 km drive to the summit. The road was as challenging as we had been warned. The paving ended shortly after leaving the Visitor Station and the ride to the summit was full of narrow switchbacks. Soon we were above the clouds and the view was stunningly clear. Pro-Tip: 4×4 vehicles often book well in advance in the Big Island. If you absolutely require a 4×4 vehicle during your trip, it is best to pre-book to avoid disappointment. 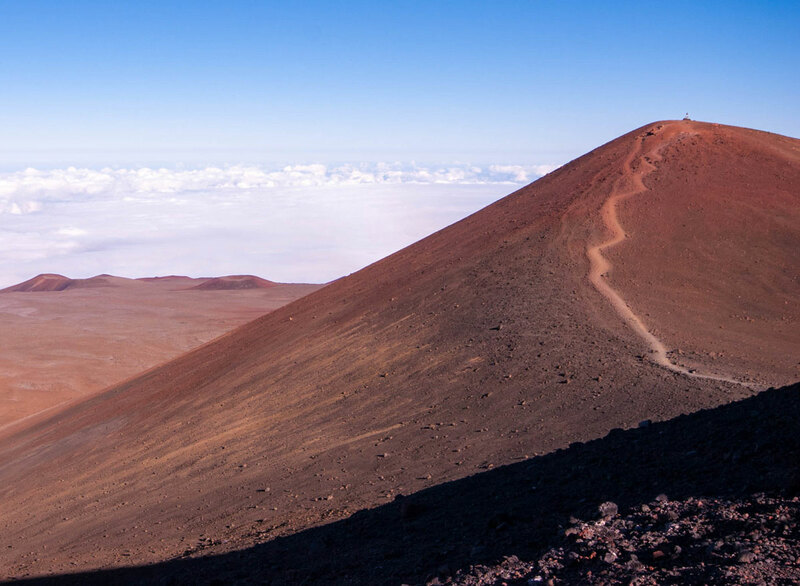 For the adventurous, it is also possible to hike to the summit of Mauna Kea. However, the steep grade and the loose terrain made of volcanic stones make the hike challenging. Add to the mix the altitude, the hike should not be taken lightly. It takes several hours to reach the summit and there are no provisions along the way so it is necessary to bring both food and water. With some time on our hands before exploring the summit, we visited the Mauna Kea Natural Ice Age Reserve. This reserve is located just below the summit and has it’s own parking area. The area is of significance because it contains the Mauna Kea Adz quarry. It is thought to be the largest primitive quarry in the world. It contains basalt stones that were used to make blades for adzes. An adz is an axe-like cutting tool used by Hawaiians during the stone age. The reserve is also home to the only alpine lake in Hawaii, Lake Waiau. Located just below the summit at almost 4000 m, it is one of the highest lakes in the United States. 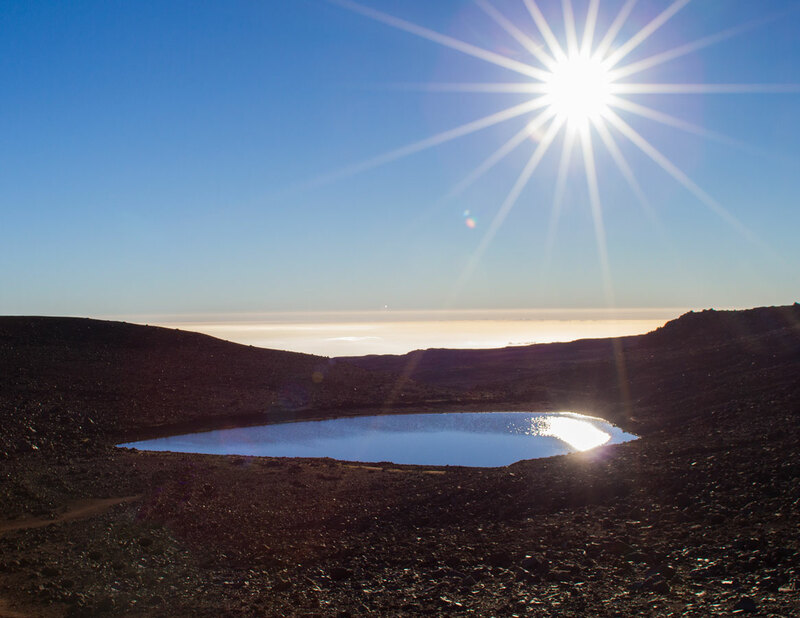 It is a small lake though and only reaches a maximum diameter of 100 m. The source of the water in the lake is unknown, but there are many theories! Interestingly, the lake dried up to a mere puddle in 2010. This was thought to be due to drought conditions that the state suffered through for a few of years. But, as of 2016, the water levels have come back to what they were before the drought. 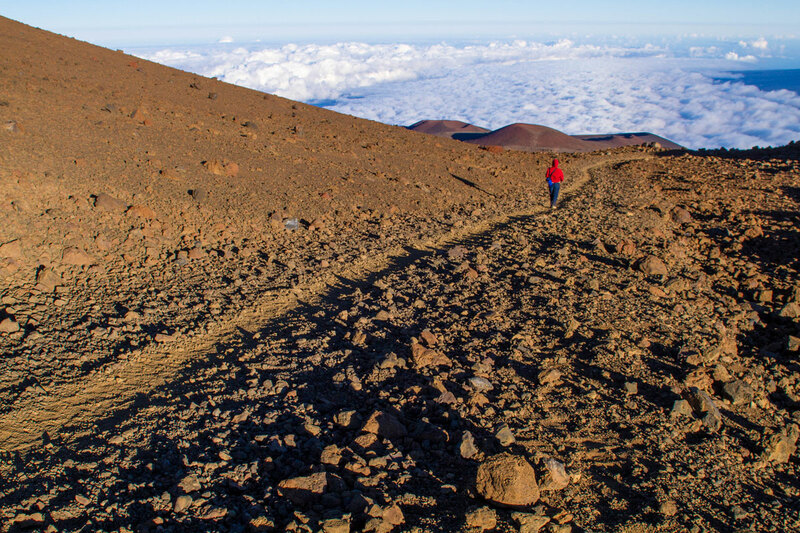 Pro-Tip: Hiking at the top of Mauna Kea can be very strenuous due to the altitude. Take your time, ensure someone knows where you are, and make sure you have plenty of water with you. At this point, we realized that the sun was getting ready to set so we focused on driving to summit Mauna Kea. 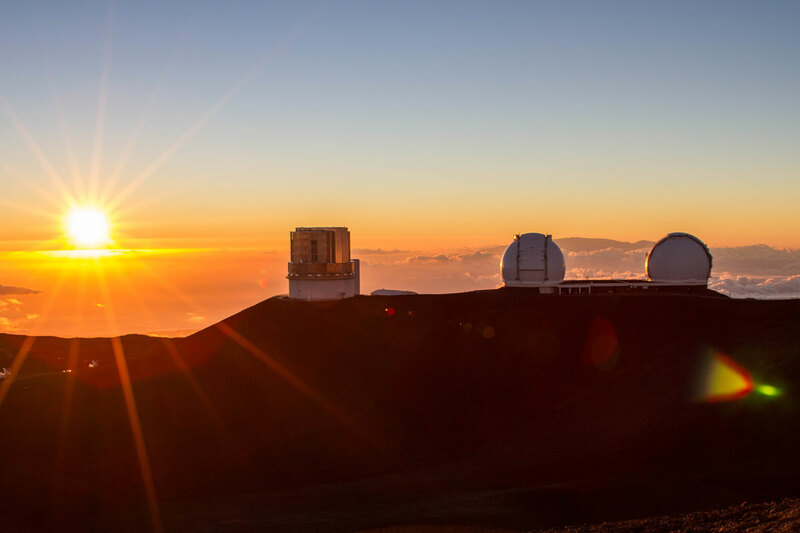 The summit is home to the Mauna Kea observatory, an astronomers playground that is not open for public use. It is an international collaboration which contains 4 telescopes (2 of which are for submillimeter astronomy), 1 optical, 3 infrared, and 3 telescopes that are optical / infrared. The Manua Kea summit is prime for galactic viewing due to the clarity of the atmosphere and the isolation of the area. There are also laws that prohibit light pollution from entering the summit. Alas, the time had come and we were able to view one of the most beautiful sunsets we had ever witnessed. We planned on staying at the summit to take some night time pictures. But, we soon realized we did not come prepared for the weather. The temperature on the summit was cold when we arrived and dropped sharply with the setting sun. The wind was also very strong making long exposure shots difficult. With this combination, we hopped back into the jeep and made our slow descent back to Kona. Now that we can cross “summit Mauna Kea” off our bucket list we would be exploring more of the Big Island. In the next few days, we will visit an active volcano in Hawaii Volcanoes National Park and diving with Manta Rays off the coast of Kona. Lovely, I live on the Big Island and have never actually made it all the way to the top, but just the visitors center. I’m never prepared since it is really cold up there and my blood is too thin! I have been to Hawaii a few times and never did anything like this. The photos are so breathtaking. Great tip about the exploring the Onizuka Center for International Astronomy Visitor Information Station. Would be a bummer to get sick from high altitudes. What a cool hike! The scenery is other worldly — it reminds me of Iceland. These are great tips for making sure people like me can get to the top safely. Thanks! Mauna Kea is really fascinating. The lake looks magical and out of the world, looks like it is on Mars or some other planet. Finally the sunset is nothing but spectacular. Ah, this place has been on my bucket list for some time (seriously, it’s even listed on our page). So jealous, and some stunning photos as well! Thanks so much Chris! I hope you get there in your upcoming adventures. It would be really cool if those observatories at least ran some open days. Do you know if they do anything like that or is it always a strictly no public use? The observatories are science facilities not open to the public, but the Visitor Centre does have stargazing equipment for visitors. I’ve read quite a few posts lately discussing Big Island and it seems incredible how many things there are to do there. That being said, this hike looks particularly appealing while the lake looks so inviting. Hawaii is definitely on my bucket list and fingers crossed it won’t be too long before I can follow in your footsteps! I definitely think it looks like Mars! I remember well Mauna Kea: it was soooo cold up there in March (not sure if month really makes big difference). Actually, I shouldn’t be complaining much – the next day after our climb there was a blizzard up there. congrats on making the summit. You managed to take some stupendous shots specially the water fall, cave and driving to the sky.. Wonderful post. I visited the Big Island as a 4 year old when my parents took me on a RTW trip. I don’t have too many memories from it except that Disney characters came to the hotel pool to play with the kids. Hawaii truly is one of the most beautiful places on earth and your post captures it’s hidden wonder perfectly. Wow! Around the world when you’re 4, that’s amazing! Reading all these sounds so adventurous! Acclimatization is very important I guess because I keep reading in all posts where such climbs are mentioned. The kids weren’t there, no mention of them how they took to all this drive to summit? Mind blowing captures. Our trip to Mauna Kea was pre-kids. We would love to take them back to experience it though. We’ve heard amazing stories about the view from the summit, especially at night. The light pollution laws let you see how truly magical the starry heavens are. This is definitely on our agenda for our next visit. I didn’t know about Mauna Kea until now but it sure looks beautiful. I think the hike no matter how strenous is worth it, just look at that beautiful view. It’s amazing that you captured the sunset. It’s sad that the observatory is not open to public, it would have been a great thing to view the stars through those telescopes. I know, it pained me just a little not to be able to go in them! Despite spending 6 months on Lana’i, I never made it to the Big Island. One of these days…. I’d love to hike up the volcano. We did a two night backpacking trip in Haleakala on Maui and it was amazing! That sounds incredible! We haven’t had the chance to visit Maui yet. I hear it’s gorgeous! I love the Big Island but have never hiked up Mauna Kea. It looks amazing! I have been to Hawaii in the past but never to the Big Island. Your photos and words are inspiring me to plan a future visit, though I doubt I’ll be adventurous to climb to the top of Mauna Kea. Wow! Never knew that about Mauna Kea. Fascinating. From ocean floor base to terrestrial peak we’re talking the biggest mountain on earth. Brilliant. Definitely added to the travel list and ready to visit 😉 Thanks for sharing! Great photos and great view. I’ve been to Honolulu but never to the Big Island. If I did, I will definitely add this on my to visit list. That photograph in the summit overseeing the clouds! Ahhhhh! Definitely an addition to my bucketlist! Great read! I am an outdoors freak and love exploring new places. I have always wanted to see an active volcano. 7 years of travel and no luck so far. Did not know that fact about Mauna Kea that it is also counted as world’s tallest mountain, on other parameter though! I would rather go here by foot than car. Hawaii is a great place to see an active volcano. They have had lava flowing into the ocean nearly non-stop for 30 years! Wow. What a beautiful sunset. I have always wanted to go to Hawaii. Thanks for the tip about the 4×4 rentals. Seems like a must have for a trip to Hawaii. A 4×4 will definitely let you get to some places that are otherwise difficult to visit. I’ve visited Hawaii many times, but I had no idea that visiting Mauna Kea was such a unique experience. That photo of the observatory from above the clouds is other-worldly. What an amazing adventure! The scenery is really so stunning! I have a friend who lives in Honolulu and he keeps on telling me about the places to see in Hawaii and this was one of them. I would like to see the Observatory and the volcanoes too. Another fun trip for you guys! Oh Hawaii! Absolutely stunning! Is the hike difficult? We only hiked at the summit, and it was tiring. You can hike from the base of the mountain, but it is a very intense hike. Don’t take it lightly. The one place we did not go to when we were on the Big Island! Next time, we will rent a proper jeep and make it to the top. Breathtaking views for sure…. Loved the Big Island! We loved it too! Mauna Kea is definitely worth the trip up. I didn’t realise there is such a big mountain at Hawaii. It looks out of this world and totally different to the the picture of the beaches and the seaside. What an interesting way to travel to somewhere totally off-beat! The sunset is really magical. That is a good capture that you have of it. Have been reading a lot about Hawaii and with your post, I am quite sure I want to visit it soon! Wow, what a landscape! Definitely not what I would have pictured for Hawaii- definitely more desert-y than lush as one normally sees in the state. WoW Christina! Absolutely stunning photos! I so want to do this sometime and it looks like I might take the hike up to the summit. The astronomical observatory looks out of this world in that landscape. Loved this post! I didn’t know you could drive up Mauna Kea! I always thought you had to hike it, and from what I’ve heard its grueling. Interesting! Thanks for sharing. We drove to the top and hiked from there. I can imagine that it’s grueling. Volcano terrain is tough to climb (2 steps forward, 1 step back). We hiked at the summit, and even that left us breathing fairly heavy. Wow, that looks other worldly up there. I love the landscape and would love to try this sometime. There is another way…I want to summit by bike! I’ve heard it would take 5-6 hours, but would make for an amazing Strava.com datapoint! I didn’t even think about that! Going by bike is totally do-able, just be careful with the altitude, as there is 40% less oxygen than at sea level when you reach the top. 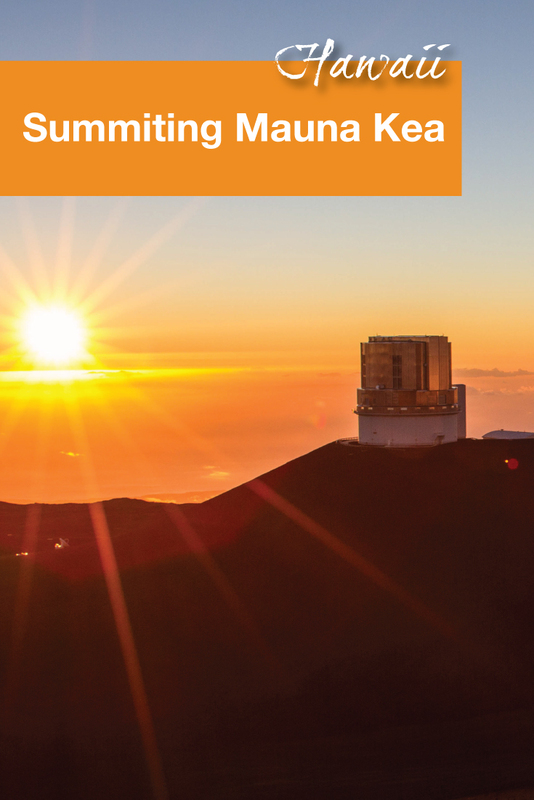 The sunset truly does look stunning – We’ve been to Maui but haven’t yet made it to the Big Island – I would LOVE to summit Mauna Kea! Would probably opt for the option to hike. Pity the free weekend tours have been closed down, will make a note to keep an eye out if the Information Center revives them 🙂 Thanks for sharing the experience! What a cool experience on reaching the summit! I hope they bring the free tours when I get the chance to visit! Thanks for sharing this. This is totally not the landscape I imagine when thinking of Hawaii! What a difference! So cool that it is the tallest mountain from the ocean floor! Wow, Mauna Kea is almost a fourteener! I wonder why it is not a national park and Haleakala in Maui is (1,000 meters shorter)!? It isn’t part of Hawaii Volcanoes National Park either! Lovely photos of an incredible place! I admire your sense of adventure. It brings back great memories of when we summited Mauna Kea with a tour ten years ago. I do highly recommend booking a guided tour. Not only is it safer (no worries about a rental car issue), but you’ll get a nice warm down parka for when the sun goes down (total bonus). Plus, you’ll get stay up as the night darkens. Many tours include stargazing with a strong telescope, including both northern and southern hemispheres. It can be a life changing experience looking into the universe and seeing how vast it really is. Excellent tips! The parka would have been a nice touch that would have kept us up there for longer! Awesome! I love visiting the Big Island but learnt a lot about Mauna Kea. There is one more way to summit…some people ride a bike up to the top! This seems like an amazing way to visit the summit! Totally adding this to my bucket-list for Big Island. 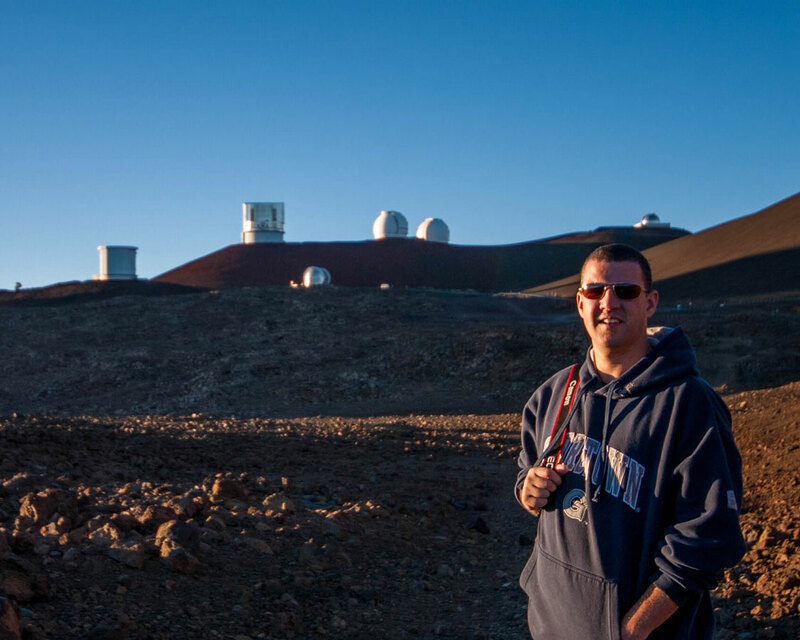 My husband’s been there and turns out that he didn’t drive up Mauna Kea (more the reason!). Going by your photos and descriptions, it all sounds otherworldly. I’m sure the beaches are a huge draw in Hawaii, but this sounds very unique! Although the weather turned a bit towards the end, you got some great shots. I especially love the sunset photo with the clouds in the background. Hawaii is amazing. I swear we had been to Mauna Kea, but I only recognise visitor information! I will have to sort through my old photos and see. We went before we started blogging, so nothing is labelled! We might just have to go back by looking at your photos though! It’s amazing how much blogging has changed the way we catalogue all our photos! Hawaii is number one on my bucket list! I’m yet to visit but I’m desperate to go! The climb looks like an awesome thing to do out there too! 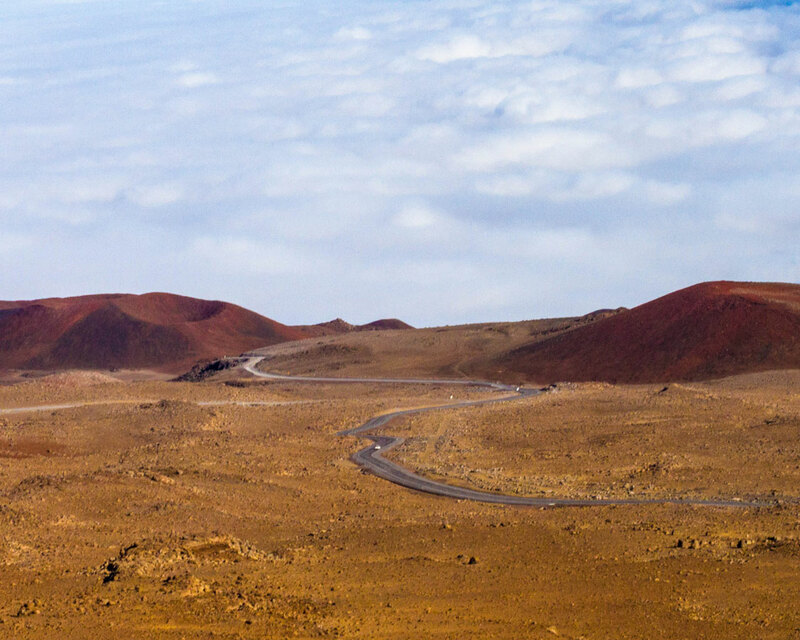 That road winding to the summit through the dry lands looks stunning and the view up amidst the clouds is incredible. Loved the capture at Manua Kea summit. Looks like an amazing experience. Congrats on reaching the summit. Your pictures are beautiful. This should go on our bucket list. 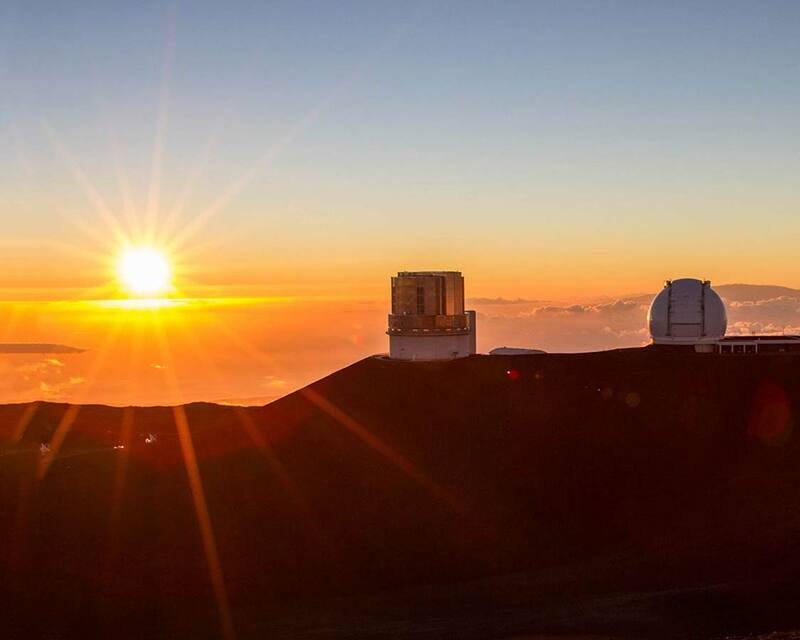 Hawaii seems like a really beautiful place to be but Mauna Kea appears to be numero uno. Your pictures are fabulous so is your blog. Do tell us some more about the food of Hawaii? Such a beautiful view at the summit! I’ve heard about the Big Island in Hawaii but never Mauna Kea. It draws so much interest to me since I’m into hiking and those captures you have there are just stunning! Amazing hike… congrats for reaching the summit. The very mention of a volcano, although dormant, makes the experience more thrilling. I loved the shot from teh summit, looking down at the clouds. A side question – what kind of plugin do you use for “related articles” section please? I really like its clean and elegant layout. Or is that build in within the page/ theme? Thank you in advance! Thanks Nika! We’re so glad you liked it and I hope you get the chance very soon! Our related posts tool is actually built into our site rather than a plugin. I’m the crazy one who will do the hike. The slower desolate way is always intriguing. I didn’t have time to go to Big Island to do this hike. So thanks for this post as now I know what to expect. Cheers!